Mississippians pride themselves on being avid outdoorsmen, fishermen, even football players. Likely you know a local golf enthusiast and maybe your next door neighbor runs the occasional marathon. What you may not know, is that tucked away behind the tall pines and magnolia trees is a little known culture of avid croquet players. Mention the word croquet at your next social gathering and likely you will conjure up images that run the gamut – everything from childhood memories of playing the game in a suburban backyard, Victorian-era scenes depicted in a favorite movie, to the fairy tale version written about in Alice in Wonderland. The game itself has been around for centuries, believed to have originated in 17th-century France from a game known as palle-maille. It was introduced to Ireland and England in the 1850’s before arriving in America sometime in the 1860’s. Believe it or not, croquet was not always a game for the elegant and well-mannered. In the 1890’s, Boston clergy lobbied to have the game banned because it brought about a great deal of drinking, gambling, and other behavior considered unbecoming. The opposition nearly threatened the popularity of croquet in American until it resurfaced in the 1920’s. By the 1950’s and 60’s, nearly every household was playing a version of the game in backyards across the country. Traditional American six wicket croquet became solidified within the American culture in 1977 when croquet champion Jack Osborn brought together five clubs to form the United States Croquet Association (USCA). Their first order of business was to establish a clear-cut set of rules – known as American rules croquet – that are still used today. The basic concept behind six wicket croquet is simple. There are two sides – blue and black balls versus the red and yellow balls. Teams can be played by two single players or in pairs. The object is to maneuver the balls through a course of six arches, called wickets, and finally into a stake. The first team to do so wins the game. While that may seem easy enough, the game combines the physical skills used in billiards and golf with the strategic planning of always thinking one step ahead of your opponent found in a game of chess. Truly understanding and mastering the game requires practice and study. 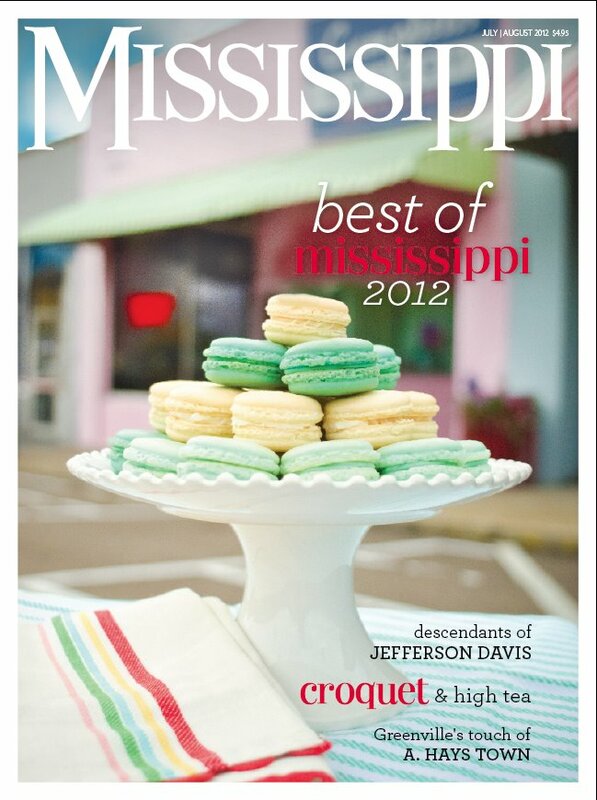 Croquet is a game that has always been rich with tradition and the croquet clubs across Mississippi are no exception. One tradition that has been passed on through the years is the requirement that players wear all white. There is speculation as to how this rule got started – some say it’s because the sport is usually played in hot weather and the white fabric reflects heat. Others say it does not distract from the game and looks more elegant. “It’s tradition,” says Jackson businessman Mike McRee, who was first introduced to the game in 1988 when longtime friend Grady Jolly presented him with a croquet set as a gift. Jolly had just recently returned from a trip to California, where he played croquet with famous winemaker Robert Mondavi at the Meadowood Club in Napa Valley. At first McRee was baffled. He was accustomed to the poorly-constructed sets used for backyard games. The set given to him by his friend was high quality. Tournament croquet is played on a lawn cropped to 1/8 – 1/4-inch high, similar to a golf course. McRee’s first stop was the local library, where he checked out several books on building a golf green. Before long, he had bulldozed a plot of land he owned in Pocahontas, MS, and within six months of building the court over 15 couples were showing up to play on a regular basis. McRee has built several croquet courts since, his most recent in 2005 when he established the Highlands Mallet Club in Flora. The group of about 15-20 couples meet every Sunday afternoon. A bracket is created to establish partners and games usually kick off around three o’clock. Ed and Hillis Becker have been members of Highlands Mallet Club for four years. They were introduced to the game by Ed’s father Jim, who has been an avid player and a longtime member of the club. The season traditionally kicks off in the spring and concludes in October with the annual Member/Guest Tournament. Members are asked to bring a guest to the weekend-long event, which kicks off with a seated dinner at a member’s house. Team assignments are made. Each team is made up of one male and one female player and novices are paired with more seasoned players. The tournament continues throughout the weekend with teams advancing to the quarter and semifinals. The winners of the tournament receive the coveted Jim Becker trophy, named in honor of Ed’s father. The weekend concludes with “high tea,” an elegant spread served right before the championship tournament. A typical menu includes a variety of finger sandwiches including tomato, cucumber mint, and chicken salad sandwiches; fresh vegetable pate; French almond macaroons; petit fours; scones with lemon curd; chocolate dipped strawberries; and hot and iced tea and champagne.